In the heady days of New York City's real estate bubble, dead today, condo developments rarely resorted to trashing one another (at least, out in the open). In ad campaigns, most never even mention the competition, abiding by the "there's enough to go around" logic. But now that we're entering uncertain times, common courtesies have been kicked out on their asses. The above ad, sent to us by former RiverdaleDevelopment Du Jour (really!) 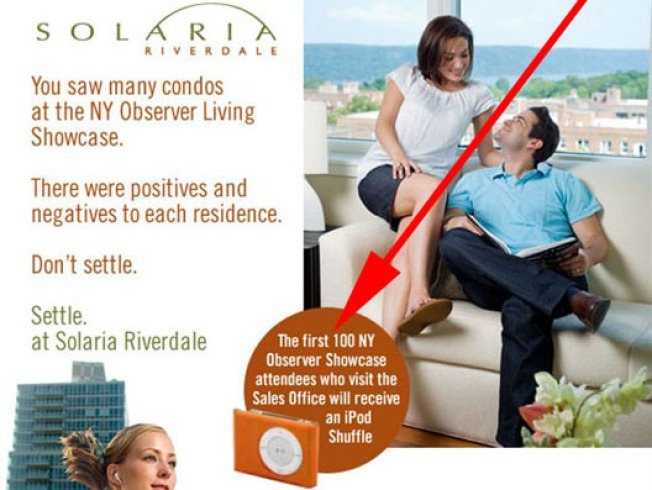 Solaria, is notable not only for its offer of free iPods to lure buyers who attended the Observer's recent condo showcase event up to the Bronx, but also for the e-mail's subject line: "SORRY LAUREL. SORRY GEORGICA." Taking aim at two of the Upper East Side's most notable new developments? Daring. But desperate times call for desperate measures.